Filed under lego on May 19, 2011. The kind folks over at No Starch, and Travis specifically, were kind enough to send me review copies of the LEGO Technic Idea Book series by Yoshihito Isogawa. As past readers know, I am very fond of the No Starch line of LEGO books with Alan Bedford’s Unofficial LEGO Builder’s Guide my absolute favorite of all time. Given their past performance with LEGO books, I was excited to read and give this series a try. It has been about a month since I received the books and I’ve finally had some time to sit down with this three volume series and develop a full BimP review. 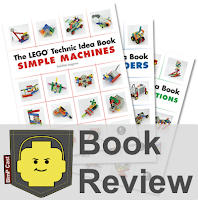 Simple Machines – A primer into the world of simple LEGO building and systems. Wheeled Wonders – Add wheels and watch your systems roll! Fantastic Contraptions – More complicated systems that exploit advanced building techniques and elements. All three books build in complexity from easy to advanced. Each book is approximately 150 pages. The books are printed on high quality paper with color images throughout. These color images are more important that you might initially think; as I will explain a bit later. The retail cost for each book is $19.95. You can find each book online at Amazon for about $12.00. At full price, each book is a pretty good bargain. At $12.00, each book is an outstanding bargain. What the reader will notice almost immediately, when browsing the sample pages online or while visiting their favorite brick and mortar book store, is that there is a dearth of text. The inside front cover fold contains more text than the pages that describe the models presented. This lack of text is also evident when reading the back cover as shown in the image below. As you can see in the image, where text on the back cover usually describes the contents of a book, this series instead uses images to present the concepts included within each book in the series. 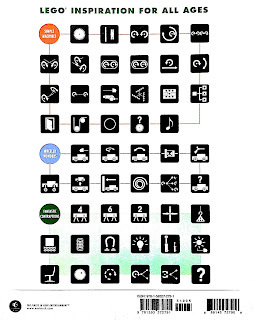 The concepts are identified by a series of icons which resemble the app icons found on modern smart phones. These icons are duplicated within the book. They are super-sized in the upper-left corner to make it easy for the reader to find each section by flipping the pages. You can see an example of this in the image below. The books do contain text. There are two-pages at the front of the book that includes an Introduction, Join the Discussion, Note to Parents and Information About the LEGO Technic Idea Series sections. Each section is identical in all three books in the series. When I first read this section, I thought the Note to Parents a bit odd. I assumed the demographic for these books was the Adult Fans of LEGO (AFOL). After I spent more time turning the pages I changed my assumptions. Of course these books would be good for children. Better yet, they would be perfect for parents and children to work through together. Learning and/or sharing the basic concepts not only of LEGO construction, but also the concepts of mechanical, electrical and pneumatic design. Earlier I mentioned that the color pages were important. Isogawa uses color to assist with the process of identifying the various LEGO elements needed as well as how to assemble each model. Take a look at the image to the right for instance. As you can see, the multi-color elements make it easy to distinguish individual elements and how they connect. Using part of the same color would cause elements to blend and make it hard to distinguish between them. Using multi-color elements also allows the author to exclude a comprehensive parts list for each model. Omitting this listing provides more space for models and ideas. It’s, quite frankly, a brilliant way to present models. I am left wondering where Isogawa obtained many of these multi-color parts. So what’s the final BimP take on this series? The bottom line is that this series will make a wonderful addition to my library of LEGO related books. I’m also going to go out on a limb here and classify these as must have books for any self-respecting AFOL or LEGO enthusiasts of any age. Every reader is guaranteed to find new ideas and concepts that will supplement or improve their own creations. The novel use of images and icons is very creative, modern and useful. This system makes it easy to locate concepts by quickly looking at the back of a book in the series, and then quickly flipping the pages until I find the icon. I then open the page and review one of the many options provided. Even without the use of this icon system, I find browsing through these books just pure fun. No book is perfect so here are a couple of things I would like to recommend. First, I wish No Starch would package the entire series into a single hard bound volume. It would make a wonderful coffee table book for AFOLs. Second, while not as bad as other books, I like a spine that allows the book to stay flat when opened without breaking the binding. This should be required of all LEGO books. Both of these suggestions are cosmetic though. They nit-pick and wishful think an otherwise wonderful series. The following quote by Isogawa is present near the front of each book and sums up the series in two sentences. This series is not about the models, although many of them are fabulous, it is about the ideas they spark for your own creations. If you are looking for a book to build a specific model, look elsewhere. If you are looking for a book that spurs your imagination or provides basic LEGO mechanical, electrical and pneumatic concepts, look no further. You will find gem after gem of ideas and concepts that will drive your LEGO creations to the next level. Even though Alan Bedford’s book is still the reigning king of the LEGO books on my shelf, I now have the reigning queen. Like Alan’s book, this is a series of books I will refer to and browse regularly. They are beautiful books that I can spend hours just pouring through. I can emphatically state that no self-respecting LEGO fan should exclude this series from their library. Is it really that good Steven? Yes, it is. So what about it readers? Do you agree or disagree? Have a copy and want to discuss or not sure you want to purchase? Drop a comment below.